Have you ever bought a printable from my shop that has tons of white space? 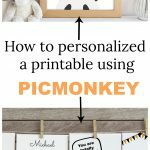 Like this giraffe or bunny wall art printable and wish you can personalize it with a name or a quote? 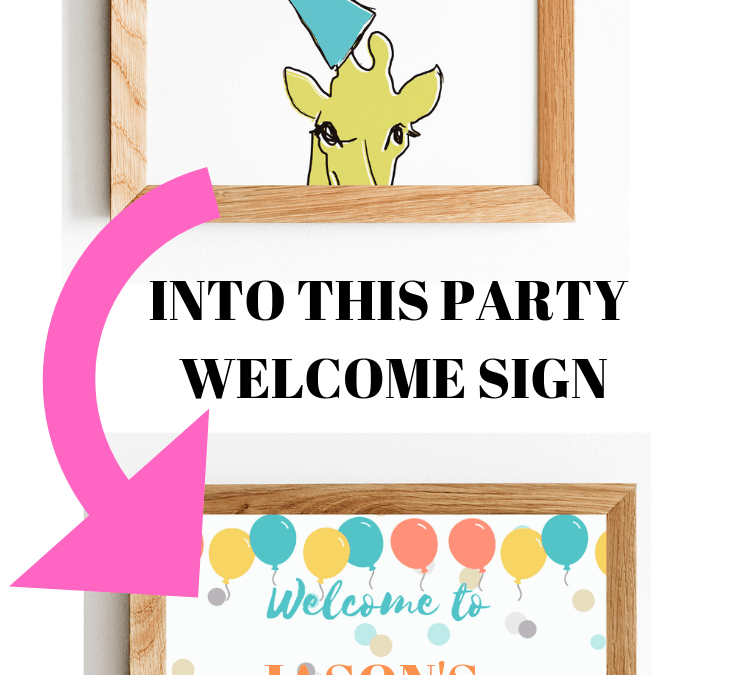 Today, I will show you how to turn my 8x10 giraffe printable into a party welcome sign using a free online design program called, Canva. Canva is an online design program that lets you create tons of beautiful posters, invitations, pinterest graphics, etc. for free. There is also a paid version of Canva, called Canva for Work. There is one feature of Canva for Work that I LOVE!!! That one feature is Canva’s ability to resize my 8x10 designs any other size I want, like a poster, an invitation, a bookmark, etc. I will show you how easy it is in my next tutorial. Also, with Canva for Work you get more free graphic options. 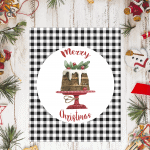 However, the free version is just awesome for doing all your home and party printables. Please note: You can only use and personalize my printables for your own personal use. Please do not modify it, claim it as your own and then sell it. That would not be so nice of you. My party giraffe printable if you want to follow along. When you get the giraffe PNG file, just right click on the image and choose save image as to save onto your computer. 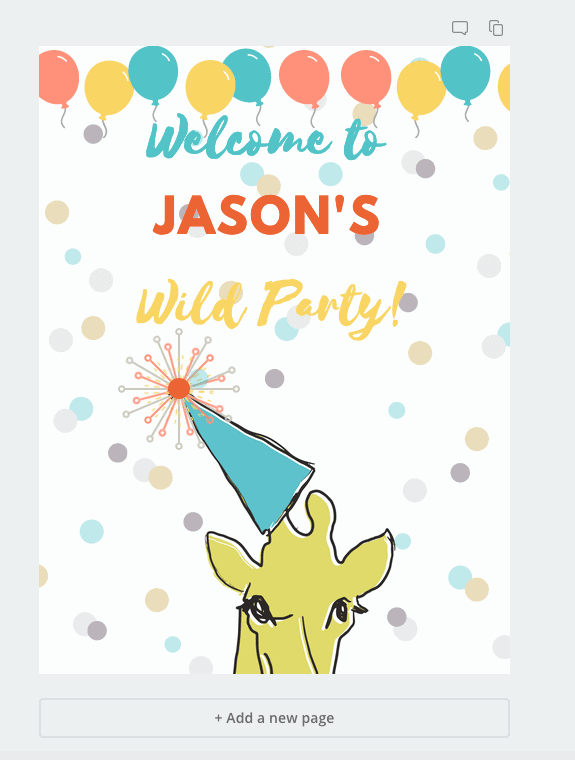 Watch the video below for quick tutorial on how to turn this giraffe printable into a party welcome sign. There is no sound, but it’s fairly easy to follow along. 1. Go to Canva website. Simply fill in the requested information and sign up. 2. Click on custom dimension and enter 8x10 in. That is the size of my nursery wall art. Click on Create new design. 3. It will open up your blank canvas. Go to Upload and Click on Upload an image. 4. Find the giraffe image that was saved on your computer and upload it to Canva. It will show up under the upload an image like in the screenshot below. 5. Now click and drag the giraffe image onto your blank canvas. Once you see the outline of the canvas turn blue unclick your mouse. The image will now fit exactly into the 8x10 canvas. Otherwise, it will just place your giraffe image down a lot smaller and your have to adjust the image yourself. Lets say you love the giraffe with the party hat, but you want to change the pom pom on top of it.. Here is what you do. You will see tons of elements that are free and some that are paid. If you want, you can filter it for just free elements by typing free and whatever you are looking for in search. If you have the paid version, Canva for Work, you can just click on free crown icon. Canva for Work offers you more freebies that you otherwise would have to pay if you have the free version. Using the search box type in firework. Click or drag it onto the canvas. If you don’t like the firework colors, you can change it to fit your party theme by clicking on the current color and changing it to the one you want. If you want the firework topper as full as mine, copy it 3 times and then layered them on top of each other, rotating them to how you like them and then group them together. The group function is right next to COPY. Doing this will allow you to move all three layers as one! You can add text two different ways. One by clicking on Add a heading, Add a subheading, or Add a little bit of body text. The other way is by using the Canva’s font combination. Canva groups two different fonts together that they feel would make your design pop. I love the Happy Birthday combination, which has the Selima and the League Spartan font. if you don’t like it after putting onto your designs you can always change the font. By the way, the font combination are grouped together. Whatever you type using this font pairing will move together. If you want to move Happy further up and Birthday separately, you need to UNGROUP. This will let you move the two fonts separately. I added the number 3 to the party hat for a little more personality. Since, I’m only doing a number, I picked Add a heading. Then type the number 3. I can change its size, color, text using the options on the top left corner. Play with all the options available to you. Lets say you find the above still a little bit too simple and what to add more colors and patterns in the background, like the sign below. Search for confetti in Elements. 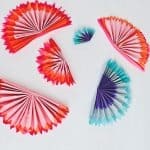 Change the color of the confetti if you want it to match your party theme. Now make copies of the confetti and drag it where you want it to go. You might have to play around with placement of the polkdots so it doesn’t cover the party hat or the words. For the words you can always change the position (upper right corner) to be in front of the polkadots. Do the same for the balloons. Find it in Elements. Copy it to make it across the top of your welcome sign. Wasn’t that super fun to do? 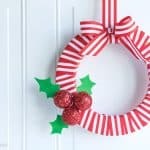 You made your first cool party printable! If you love this giraffe polkadot welcome sign the way it is, you can download it here and just modify the name. I will omit the name and the number on the hat for you to personalize yourself. You can download the party hat giraffe with confetti and balloons here. Your work is automatically save onto your Canva account. If you want to share your design with others, you can click on Share. You get the options of either inviting people to edit or view your designs. The other sharing option is through a link. If you want to download your finished work onto your computer, you can click the down arrow next to the Share button. I normally save my design in PDF Print. If you choose Publish, you get more options including having Canva print and ship the finished design to your door. I have not tried it, but the pricing is fairly reasonable. And it’s free shipping. Love THAT! I hope you found this tutorial helpful. I plan to do more in the following weeks. Next, we will turn the giraffe printable into a party invitation. Pin this tutorial for future reference. Let me know if you would to create more fun designs with me in Canva by commenting below!